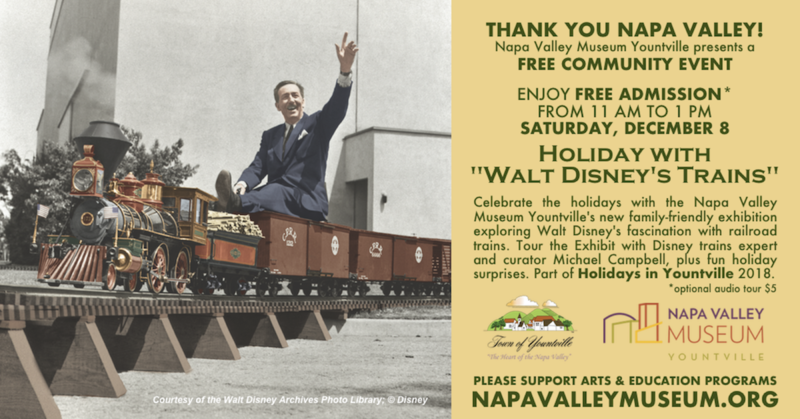 On December 8 from 11 to 1, the Napa Valley Museum Yountville says THANK YOU to our Napa Valley community with a FREE holiday event! Exhibition curator and Carolwood Pacific Historical Society President Emeritus Michael Campbell, a Disney trains expert, will conduct a tour through the exhibition, including a demonstration of a working steam train! Experts from the Napa Valley Model Railroad Historical Society will be on hand to demonstrate our original Napa Valley model train, created in partnership with the Napa Valley Wine Train. Enjoy cider, hot cocoa and cookies, plus a pop-up appearance by our own mischievous “Elfie.” Part of the Holidays in Yountville Celebration. (photo above of Michael Campbell with the “Lilly Belle” at the Walt Disney Family Museum). THIS FREE COMMUNITY EVENT IS MADE POSSIBLE BY GENEROUS CONTRIBUTIONS FROM THE MEMBERS & SUPPORTERS OF THE NAPA VALLEY MUSEUM YOUNTVILLE. PLEASE SUPPORT OUR ARTS & EDUCATION PROGRAMMING BY DONATING NOW!